Have you ever wondered about the meaning of A U M (OM)? You probably chanted it many times in yoga class, but do you know what it means? I can admit I didn’t know for quite some time, and when I finally got acquainted with it better, its chanting took me to a whole new level. “The first is called Vishvanara, in which one lives with all senses turned outward, aware only of the external world. Taijasa is the name of the second, the dreaming state in which, with the senses turned inward, one enacts the impressions of past deeds and present desires. The third state is called Prajna, of deep sleep (dreamless sleep), in which one neither dreams nor desires. There is no mind in Prajna, there is no separateness; but the sleeper is not conscious of this. Prajna, all-powerful and all-knowing, dwells in the hearts of all as the ruler. Prajna is the source and end of all. The sound of A comes from the belly and is made with the mouth open, the sound U is formed in the middle of the mouth with the mouth a bit less open than before and with the sound M the mouth closes completely. Then the sound rises through the nasal passages, where the resonance, the fourth aspect of A U M, forms. Furthermore A is the first letter of the Sanskrit alphabet, U represents connection and continuity, and M is the last consonant of the Sanskrit alphabet. A U M thus represents everything that can be expressed in letters/words. Since the sound carries on, resonates, A U M also represents that what cannot be expressed in words. A stands for Vaishvanara. Those who know this, through the mastery of the senses, obtain the fruit of their desires and attain greatness. U indicates Taijasa. Those who know this, by mastering even their dreams, become established in wisdom. In their family everyone leads a spiritual life. M corresponds to Prajna. Those who know this, by stilling the mind, find their true stature and inspire everyone to grow. With the sound of A U M everything is said. Next time you chant this mantram remember its meaning, feel it while chanting, feel the expanding. You can also try chanting the mantram with holding a hand posture called Shankha Mudra (Conch) – it should help with every kind of problem of the throat and develop your voice. It is also used to bring your conscious awareness within yourself in deep silence. Encircle the left thumb with 4 fingers of the right hand. Extend the fingers of the left hand and touch the right thumb to the left middle finger, so that the two hands form a conch shell. Bring hands to touch the body at the level of the heart or sternum and chant A U M 21 times. I hope you enjoyed this post, if so, please let me know, I’m always happy to get your feedback. 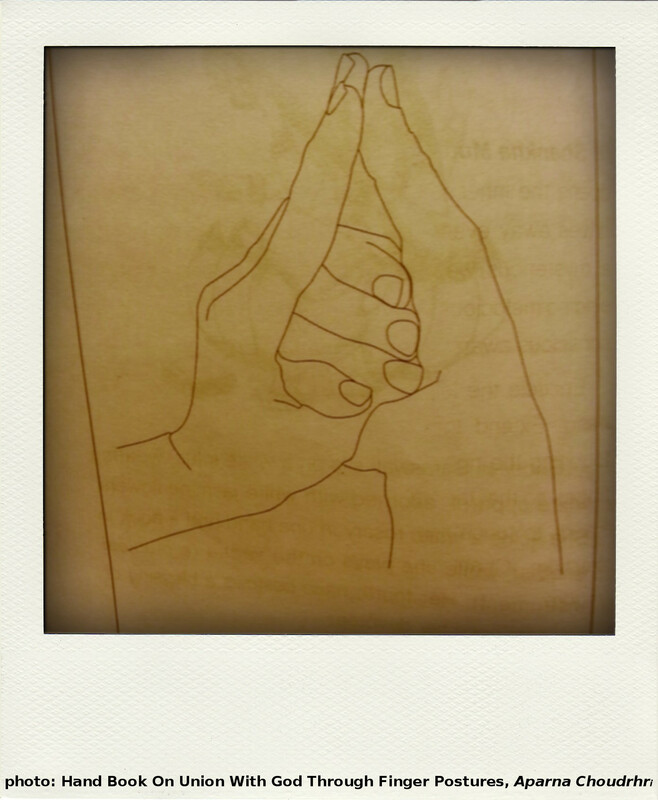 – The Hand Book On Union With God Through Finger Postures, Aparna Choudri. 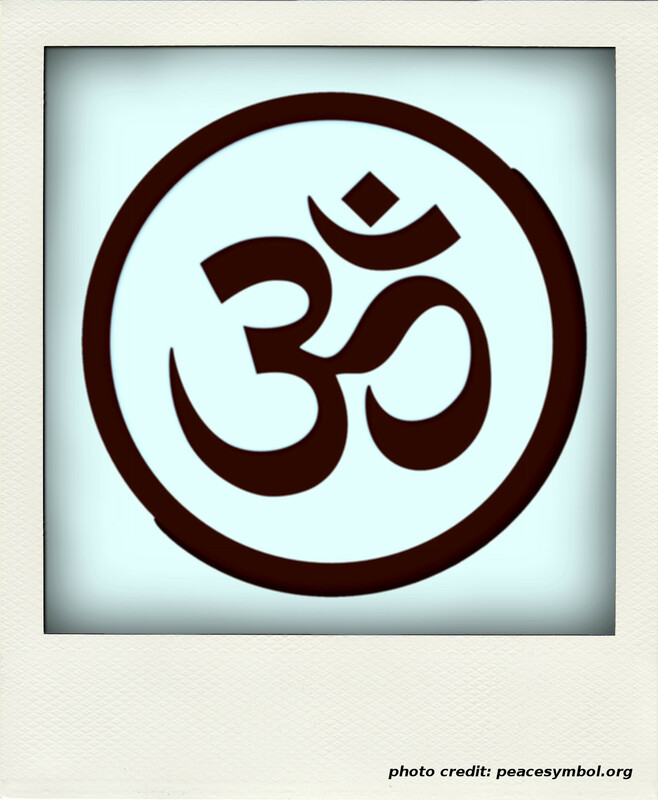 This entry was posted in Yoga and tagged AUM, chanting, Sanskrit, Yoga. Bookmark the permalink.